I finally cleaned and organized my crafty table this weekend and even played a bit making some tags. 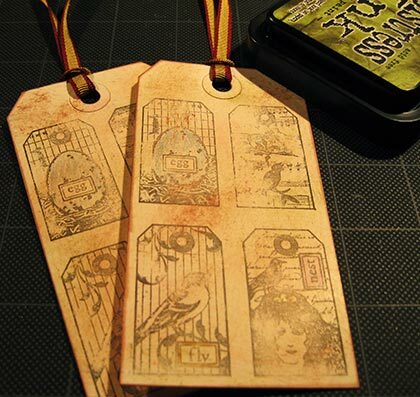 I know some people like to make these tags for scrapbooking or for gift bags. I actually like to make these and using them as bookmarks. They are kind of perfect for that don’t you think? My tags didn’t come out exactly like I wanted them and I think it’s because I was using glossy cardstock but it was still fun to use some of my new rubber stamps. I cleaned up after crafting so I’m ready for the next project. When this is passed on to you, copy the whole thing, skim the list and put a * star beside those that you like. Add the next number (1. 2. 3. 4. 5., etc.) and write your own blogging tip for other bloggers. Try to make your tip general. After that, tag 10 other people. Link love some friends! Just think- if 10 people start this, the 10 people pass it onto another 10 people, you have 100 links already! 12. Participate in Memes. It’s fun to find the eight things that are odd about you or the four things you enjoy doing besides blogging. You get the idea. 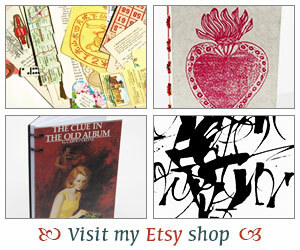 http://www.bookgirl.net. I’m actually not going to tag anyone. I know, I’m breaking meme protocol but I think a lot of people have done this one already. I know I’m enjoying the answers. I like this MEME but I am not sure if I can handle more links, KWIM? I hope that you find time to do more! Thank you for playing along!! I like this one! The tags are wonderful and definitely make great bookmarks! I always thought those tags were cool, but I never got around to making any. I was thinking that I need to maybe get rid of some of my paperarts supplies as it all takes up so much space, and I have not been doing anything for ages. But then this weekend I was at Michaels and was looking at the newest Somerset Studio (which I used to subscribe to, but then I let it run out and haven’t been buying issues), and I remembered how much fun it is to do this stuff, so I may just have to try and condense supplies and not get rid of them. If only I had more time…and those do make great bookmarks! Wow, those are wonderful tags, Iliana! I just did this meme too, I am loving all the great blogging tips that have been contributed by our fellow bloggers. Isabel – Me too! This week will be tough. Work is insane and I’ve got a couple of things going on in the evenings too. Crafting may just have to wait until the weekend. Stephanie – Thanks for tagging me! Danielle – I briefly thought about putting all my stuff away too. It does cut a lot into reading but I miss making things too. I also gave up on Somerset Studios but watch I’ll go back to them in a while. Lotus – Thank you. Those tips are fun aren’t they. Plus, more people to visit! Matt – Anything to expand the ever growing bookmark collection. Ha,ha. Those tags will make great bookmarks! They will mark your place with something beautiful that gave you the added pleasure of creating. Those are really cute tags! I’ve started on a scrapbook myself and I can’t believe how much work goes into making just one page. By the way, I’ve tagged your for the Meme of Four.